Russia&apos;s Alexander Barabanov and Jordan Greenway of the US vied for the puck in a preliminary round game. 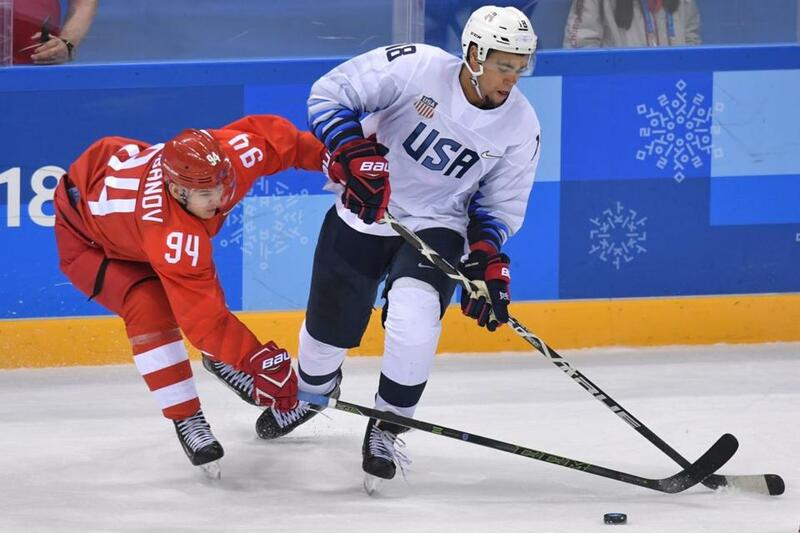 GANGNEUNG, South Korea – Jordan Greenway was wrapping up a postgame interview following the United States men’s hockey team’s 4-0 loss to Russia on Saturday when he was asked about the team’s outlook for the rest of the tournament. “I don’t see any reason why we’re not in the gold-medal game,” he said. Then he turned to head to the locker room to begin the process of regrouping with his teammates, many of whom also expressed confidence the US could bounce back. But the fact of the matter is the US faces a long climb to get to that gold-medal game. A bigger, stronger, and more experienced team of Russians — officially introduced as the Team of Olympic Athletes from Russia — dominated the US in the final game of the preliminary round for both teams on Saturday. The result means the US drops into the single-elimination play-in round ahead of the quarterfinals. Had the US won, it would have clinched the Group B title and advanced straight to the quarterfinals. Coach Tony Granato was fine with Greenway’s confidence. With a lineup featuring with former NHL stars such as Pavel Datsyuk and Ilya Kovalchuk and loaded with current KHL stars, Russia was too much for the US. Kovalchuk scored two goals 29 seconds apart — with 0.2 seconds left in the second period and again just 28 seconds into the third — to lead Russia. Nikolai Prokhorkin also scored twice, and goalie Vasily Koshechkin made 29 saves for the shutout. Despite the lopsided score, many US players felt they’d held their own against the Russians, who lost to Slovakia in their opener but whipped both the US and Slovenia. The US won’t learn its next-round opponent until after Sunday’s final day of preliminary round play. Russia won Group B, while Slovenia, the US, and Slovakia all finished with 4 points. All 12 teams in the tournament advance, but the three group winners plus the next-best team get byes. The remaining eight play for the four other spots in the quarterfinals. Russia, Canada, Czech Republic, Finland, and Sweden have set the bar in the preliminaries. One of the last four will drop into the play-in pool round because only Russia has clinched its division. US goalie Ryan Zapolski, who received a vote of confidence from Granato after the game — “He’s our goalie,” Granato said — thinks the Russians are strong, but not unbeatable. However, time is running out. The US has managed just four goals in three games. But if the scoring picks up, Granato thinks anything is possible. And he’d like to prove it against the Russians. “I’d like to see them again,” Granato said.